The presence of an unregenerate tweeter in the White House places social media in the spotlight. The current state of the White House reveals it as an extreme locus of power, division, anxiety, instability, temper, ignorance, deception, self-interest, and antipathy. 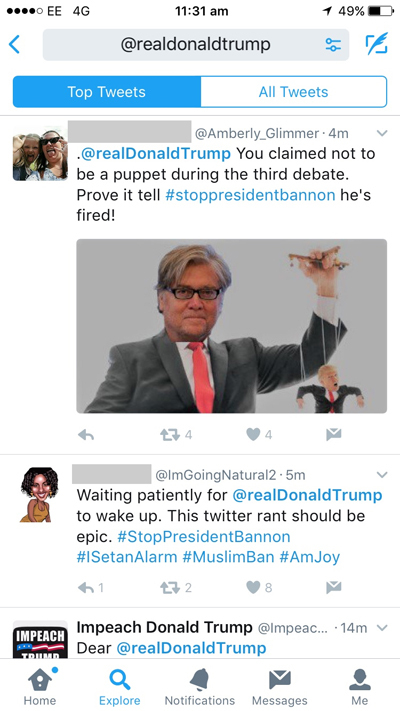 Trump’s use of Twitter provides an excellent case study illustrating what people can do with social media, and what it can do to them. Why should any right-thinking professional indulge in this medium? After all, a cursory browse through the Twitter stream of any high profile micro-blogger demonstrates that anyone with online access can link in and contribute to the flow. It’s not always positive. Note the tweets and comments that intrude, criticise, poke fun, incite, subvert, deflect, insult, threaten, demean, defame, and abuse — not to mention reinforce bias and distribute falsehood. No wonder some individuals refuse to engage. But many of the rest of us persist. Twitter is an unregulated and unmoderated medium, filled with scandal, gossip and insults. We professionals are encouraged to have a social media presence, but what is the use of it for any serious organisation, firm, practice, cause, or movement? Several celebrated reasons to tweet persist. With Twitter you can broadcast what you want people to read, see and hear, unmoderated and unmediated. You can speak directly to your audience — “the people” in the case of @POTUS. With it people can circulate and solidify opinion and build community. Producers and activists can use Twitter to gather feedback from their constituencies and audiences. In the right hands and under favourable circumstances tweets can excite the attention of mainstream, media, as long as anyone is paying attention, i.e. noisy people can make an even bigger noise, and create a “twitter storm.” With a concerted social media strategy, tweeting forms one of a panoply of interrelated communicative actions: press releases, articles, events, speeches, rallies, advertisements and merchandising. 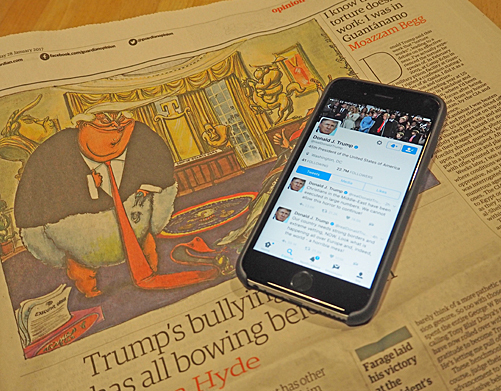 For people with a mind to it, tweets can be deployed to sow confusion, as several commentators have indicated in the case of the current POTUS, in his case fomenting haste and distraction with relatively trivial controversies while sneaking through a more serious agenda (see Guardian article). Tweets sustain a background of ambient news awareness. Few people follow assiduously every item in the mainstream news, and on all topics all the time. Nor do they acquaint themselves with every viewpoint. And since 20 January 2017 the news and “fake news” has streamed thick and furious. It seems that most people tend to extract from the noise whatever information reinforces their own position. Some slacktivists (like me) find browsing youtube videos of satirists, disbelieving journalists, and vitriolic tweets directed to @realdonaldtrump a form of therapy. In fact, I don’t think I have ever seen such unbridled contempt amongst the intellectual, professional and artistic classes against a democratically elected leader. Is there comfort in that? Tweets are terse, sloganistic and ambiguous. It now appears that Trump is a literalist. His tweets are to be taken both seriously and “literally” — except when he is being “sarcastic” according to one of his earlier campaign tweets. At least in the current climate it’s open season on a world leader who tweets insulting demands to the leader of a sovereign neighbour (Mexico) bypassing diplomatic negotiations, signs an order banning citizens from selected Muslim countries from entering the US, endorses torture, and singles out individual mainstream news sources as peddling “fake news,” amongst a torrent of other high-risk invective. Leading technology companies, including Twitter’s Chief Executive Jack Dorsey, have spoken out against Trump’s clumsy executive order on immigration — Dorsey’s appropriately delivered as a tweet. Also see the Washington Post article about how US high tech companies object to the ban on refugees from Muslim countries. Many leaders in all walks of life use Twitter effectively, and know how it can inform, encourage, amuse, and support. It can also lay bare a dark and troubled mind. The Guardian cartoon is by Martin Rowson. Also see posts: Unaugurate, Are humans just machines for propagating tweets, Social media help you to believe what you want to believe, I am Spartacus, and Wicked problems revisited. Always good to have an outside perspective on the political madness here, Richard. As most of us alternate between despair and disbelief, well-aimed satire provides our only comic relief. Re/ therapy: yes, but there is an urgent beed for research and data, not just about tweets (on which Farada Vis, at her Visual Social Media Lab is excellent) but the wider social media system of which they are a part – and in which the UK’s radio and newspapers play a key role in providing content and shaping the narrative. Does anyone know where/who is gathering data about the relations between Rupert Murdoch (a Trump ally) and other interests behind the UK newspapers who, for example, this morning ridiculed and belittled the protest against Trump’s anti-immigrant legislation, speaking about it as if it would decrease, not increase the threat of terrorist violence (thus making the UK’s national discussion out of synch with much of the US legislature); the funding behind Farage, and the organisations to which it is linked; or who is making a collection, analysis and repeated dissemination of the fraudulent claims made by the leave campaign which swayed an evenly distributed vote? Because of Brexit, Theresa May is making the UK a key source of legitimation for a far right-wing coup in the US (Steve Bannon et al), after a suspect election result, which, in the words of National Public Radio (heard in LA on December 17th) is the first time in US history that a US President (Clinton, with an unprecedented margin, more than some winning presidents, of 2.8 million) has not been able to take up office due to the electoral college system (reformed by the Republicans in 2013 to enable such an anomaly). And who is blogging about Radio 4 news on the BBC? The today programme needs daily critical reading, as it, too, participates in the manipulation of perceptions, both consciously (Farage, who could not get elected to office in the UK, given more air time than elected officials; Gove invited to give opinion pieces) and unconsciously (unreflective repetition of seeded material which helps control a narrative). The gathered data about these practices is key. We have two elections here which were legitimised, gradually, by the response that followed. Please if anyone knows who is working on these things, could they pass on the links? Hi Clare, Many thanks for this contribution. This is a late response from me … and aren’t things moving fast! It will be interesting to see what happens during Trump’s current overseas tour. I often think the BBC bends over backward not to appear anti-government, and hence at present to appear pro-brexit, though the Guardian seems more critical. Thankfully we still have a range of news outlets and opinion-makers.